Payumoney Payment gateway site is offering Rs 100 movie voucher on just registering with any referral link.You can use this 100 Off code on minimun trasaction of Rs 250.You get also Rs 50 per refer when your Referred friend transact Rs 250 or More with payumoney. 2.Now Select I am a buyer and enter all required details. 4.On dashboard under Reward section you can see your Rs 100 off Movie voucher,You can use it on movie ticket booking on Bookmyshow or Fastticket or Ticketnew. 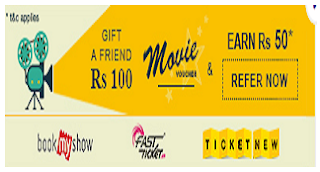 For Redeem Code Go to any site BOOKMYSHOW OR FASTTICKET OR Ticketnew,Book movie and seat of Rs 250 or More,on payment page select Payumoney option.You will be redirect to Payumoney payment page login with your account and apply your coupon. 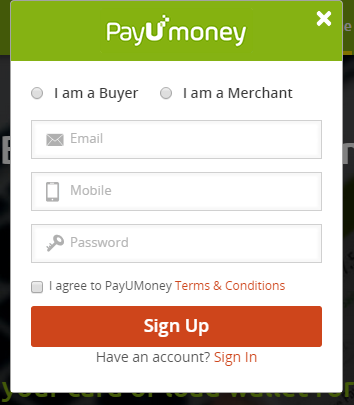 5.For More Points Select Referral Program from Dashboard.There you can see your Referral link ,Share with your friends.When Referee will sign up through your Referral link,he will get Rs 100 off movie voucher.And when he will transact Rs 250 or more with payumoney,Referrer will get 500 points (Rs 50 )in Payumoney Account. Hello Friends, I am Preet Vijay. I’m the Founder of rechargetricksbuzz.com. I am a Professional Blogger. I like to post about free recharge tricks, hot deals, tech news and many more stuffs.